JuLeS4U make these beautiful bracelets using faceted Czech glass beads to symbolise the traditional meaning of Amethyst. 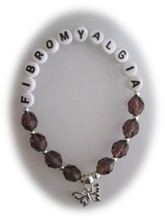 The silver butterfly charm represents how the pain of fibromyalgia can flit from place to place, and the wording promotes awareness. Amethyst represents stability, peace, balance, courage, inner strength, sincerity and a calm disposition.